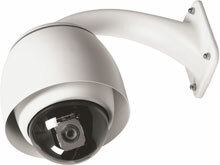 The Bosch EnviroDome Camera System has been discontinued. No direct replacement is available. Whatever the weather may bring, the Bosch EnviroDome Camera System maintains peak performance, making it the ideal solution for perimeter surveillance, parking lots and other outdoor applications. The EnviroDome Camera System has all of the features needed to capture the details missed by other cameras.